When you receive your shellfish, remove them from their packaging and check that the shells are closed. Tap any open ones on a hard surface, any that do not start to close should be discarded. Place the shellfish in a bowl or tray and cover with a damp cloth or paper towel and put them in the bottom of your fridge or the warmest section. Don’t be tempted to place them in water as this is not the best way to keep live shellfish. How long will they stay fresh? Your shellfish should stay live and fresh in your fridge for two to three days. Mussels will need to be bearded – that is the removal of the stringy material that keeps them attached to the rocks they grow on. This process should be carried out just prior to cooking. 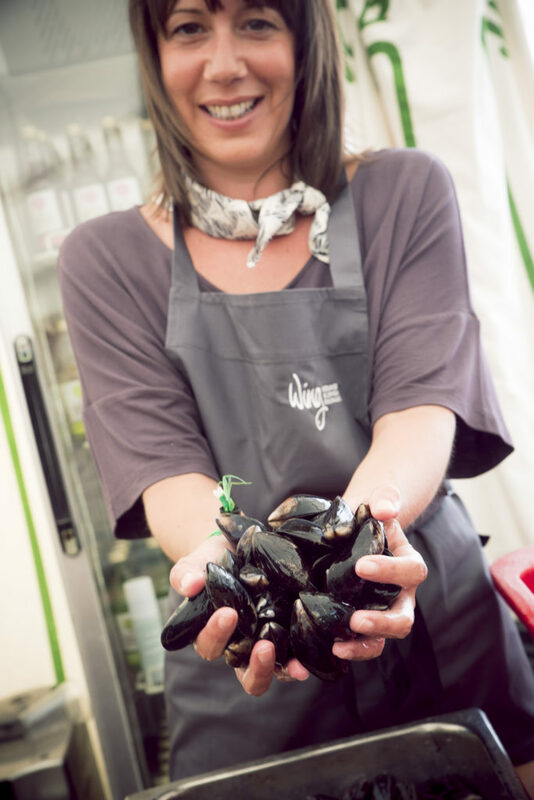 Although our mussels are cleaned before despatch, it is always worth checking that the shells are clean too. Discard any mussels that do not close when tapped on a hard surface. Cockles and clams need only be rinsed; discard any open ones that do not close when tapped on a hard surface. Oysters should be opened immediately before serving. Discard any that are not tightly closed. To open an oyster, first fold a tea towel into your left hand. Place the oyster into the towel with the hinge facing towards you. With an oyster knife or any short bladed knife with a strong blade, insert the tip of the blade in to the hinge. By moving the blade side to side the hinge will break open. HOLD THE KNIFE BY THE TIP OF THE BLADE AND NOT BY ITS HANDLE, this will ensure that should the knife slip whilst opening the oyster, you will not cut yourself. Remove the oyster from its shell, wash in salted water and return it to the shell. See our Crab and Lobster Storage and Preparation pages.